Though the role that Jews have played in the formation of the comic-book industry has been well documented, there has been a plethora of fresh scholarship on the subject. 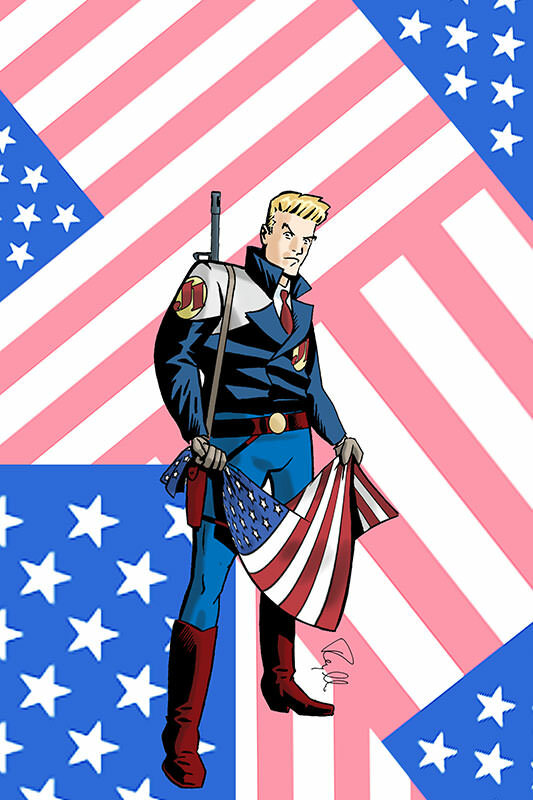 In just 2008, these include From Krakow to Krypton: Jews and Comic Books, Disguised as Clark Kent: Jews, Comics, and the Creation of the Superhero, and Jews and American Comics: An Illustrated History of an American Art Form. (I reviewed a similar book, Men of Tomorrow, here.) These books have been driven, no doubt, by the increasing prominence of comics—particularly in mainstream entertainment—and the fact that the first and second generation of cartoonists, editors and publishers who worked in the industry are disappearing. As part of this resurgence of interest in the subject, the Skirball Cultural Center in Los Angeles is running an exhibition called "ZAP! POW! BAM! 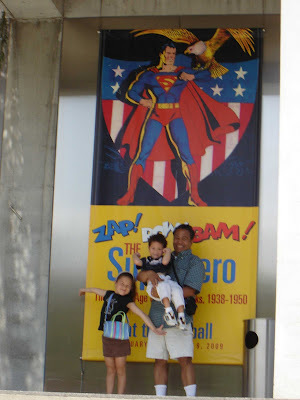 The Superhero: The Golden Age of Comic Books, 1938–1950" through August 9. 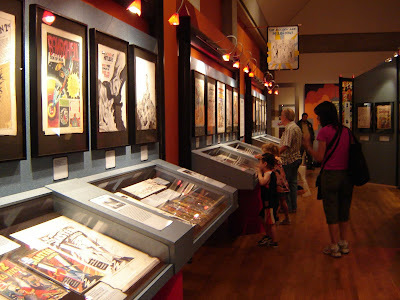 Anyone with an interest in comics and, particularly early comic books, will enjoy the exhibition. 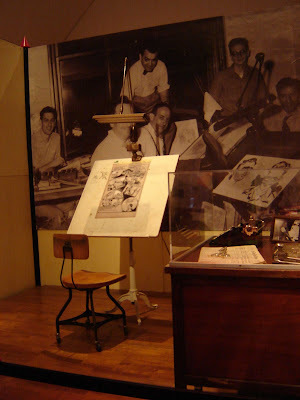 While the show focuses on the contributions of Jewish writers and artists to comic books, any story about the early days of the industry is inseparable from the Jewish experience—like movies, comic books in the beginning were not a "respectable" business and, hence, the only industry open for Jews to enter. Anyone with some knowledge about comic-book history will be on familiar terrain in this show: people like Jerry Siegel, Joe Shuster, Jack Kirby, Will Eisner, Stan Lee, Bill Finger, Bob Kane, Otto Binder, etc., are all profiled here. The exhibition is especially well stocked with original comic-book pages, and includes a few kid-friendly touches. 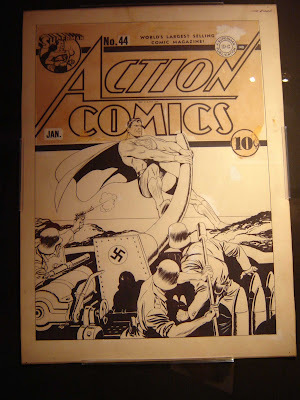 (The original art to the iconic Superman image that accompanies this blog is included in the exhibit.) The show also is paired together with a related exhibition called "Lights, Camera, Action: Comic Book Heroes of Film," which also runs through August 9. Located just one exit north of the Getty Center in Brentwood/Los Angeles off of the 405 freeway, I highly recommend a visit to the Skirball for this exhibit, as well as for its outstanding reputation as a Jewish cultural center that hosts movie screenings, cultural events, and exhibitions about Jewish history and the Jewish experience from earliest times to the present day. If you have children, the Center also has a permanent "Noah's Ark" exhibition geared towards families and children. The museum itself is free, but reservations and paid entry is required for "Noah's Ark." Visit the Skirball website for details.